I, Lindsey Vogel, do stand before you today admitting that I am an absolute candle fanatic. I’ve been buying and burning candles since I was old enough to light them myself! I always have no less than 2 candles burning in my home at any given time. In 2017, right after my son Jack was born I had a conversation with a girlfriend and fellow new mommy where she educated me on the health and environmental dangers of refined paraffin wax… and from that conversation, my very own soy candle line was born! Because after all, if it’s not good for baby Jack, it’s not good for anybody! 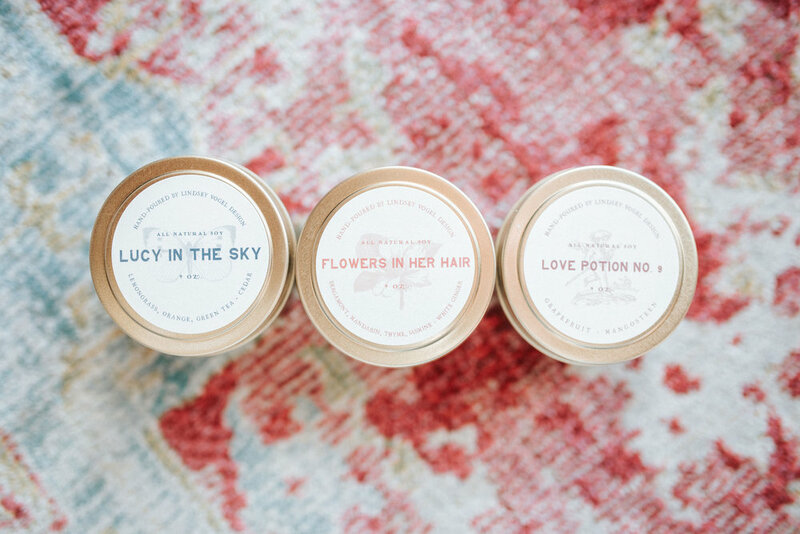 A little bit of my heart is poured out into each and every one of these candles, and just like the classic books or songs I designed them to look like, I hope that each candle takes you on a scent journey that fills your home and your heart! Please take a look at the different jars and gift sets available to you! If you are interested in wholesaling, custom party favors or white-labeling for your own boutique, please e-mail me. The big kahuna, the mac daddy, these seventeen ounce vessels are the biggest in the collection. An opulent frosted white jar paired with a hammered copper lid transforms an everyday candle into a featured piece of art for any tablescape or shelfie. They work wonderfully with classic decor but can add a touch of whimsy to your space. Burn time for these candles is approximately 100 hours. My personal favorite, these amber jars speak to my soul with their rich mahogany shine that’s paired perfectly with a wooden top that is so fresh and raw that you can just imagine the lumberjack cutting and turning the wood especially for you. Amber jars are great for adding a vintage, masculine or apothecary vibe to your space. They pair nicely with a stack of books of a bouquet of eucalyptus stems. Burn time for the amber jars about about 80 hours. Since of course gold will always reign supreme, I had to find a way to work them into the collection! These 4 ounce tins are the perfect way to test out new fragrances, as they are the perfect, compact size! Perfect to give as gifts, or to try a new, bold scent in your bathroom or bedroom, they are mini but they pack a big, big punch! Burn time for tins are about 40 hours. Perfect for the flame-fraidy cats, firefighters wives & lovers of wax melters, I’ve got the perfect scent cubes for you! They have the same great scent as our standard candle, but in cube form!